This page contains material that either does not warrant a page by itself, or does not fit into other existing pages based on topic, or we just haven't had the time or seen the need to expand the topic to it's own page yet. Enjoy! BellSouth vehicle photos and descriptions - submitted by an anonymous website visitor. More info on the topic of "This is a recording" plus some audio files to play. Contributed by an anonymous visitor to this website. The Bell System Pavilion - 1962 Seattle World's Fair - Some multimedia segments from the film "Calling Century 21"
Photo taken at the Nixon museum in Yorba Linda, California of the telephone Nixon used to talk with the Apollo XI astronauts on the moon. The photo is a grainy because flash photos aren't permitted. Photo taken by a website visitor who wishes to remain anonymous. "Our Living Past - A Strategic Asset" an AT&T's FOCUS magazine article, January 26, 1988. "Bell's Telephone" article from page 277-288 of the December 1877 publication called "The Manufacturer and Builder". What Killed Ma Bell? - A link to another website. If the link doesn't work, there is a text archive of the article HERE. Scans from "The Birth and Babyhood of The Telephone"
Scans from "Legacy and Promise - The Story of Southern Bell"
"Understanding the North American Numbering Plan"
Mobile Telephone marketing material from about 1980. "Rules for Troubleman" - a document from the year 1911 outlining the do's and don'ts for the "telephone man" of long ago. 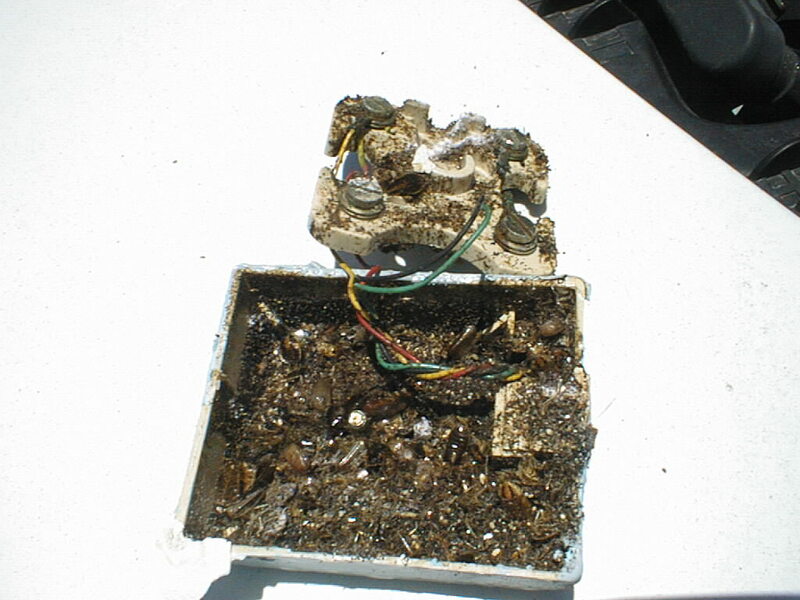 Contributed by "Bill", a Service Technician for Verizon / Bell Atlantic since 1978. Here's something you don't want to look at while eating. This photo was sent to me by Andy Krop who states, "What you see is a jack I removed from service in an apartment in old town Placentia. Can you guess what the problem was? Those are 20+ years of solid cockroaches bodies caked inside the jack!" PHILADELPHIA, Sept 12 (Reuters) - AT&T Corp. (NYSE:T - news), the No. 1 U.S. long-distance telephone and cable television company, said its communications network carried a flood of heavy calling volume on Wednesday, but remained unharmed after its equipment survived the collapse of the World Trade Center. AT&T handles about 300 million voice telephone calls a day. It carried 431 million calls on Tuesday as customers flooded the telephone lines in the wake of the attacks on the World Trade Center and Pentagon, making it the heaviest business day in the company's network history, Johnson said. 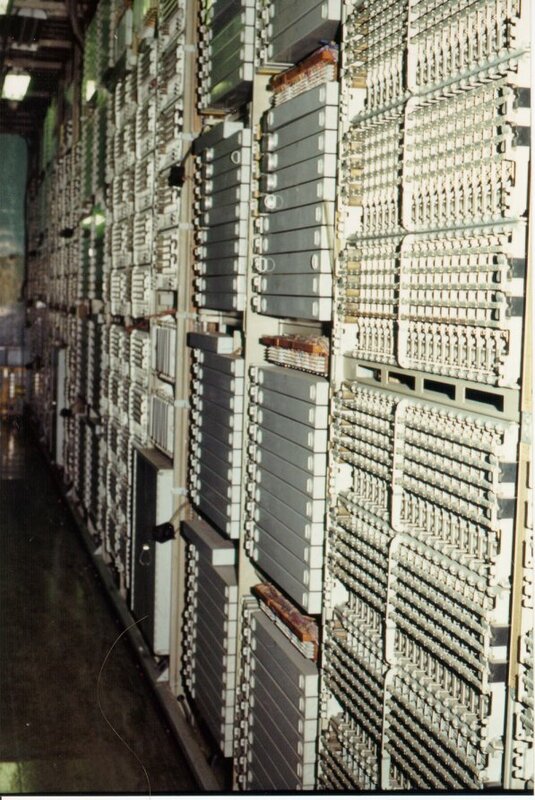 AT&T's local network switching equipment, which routes telephone calls, was located in the basement of the World Trade Center towers and survived the implosion of the buildings, Johnson said. "It appears the equipment has survived ... It was up and alive and still providing dial tone by 4 o'clock yesterday afternoon. Once the back-up batteries ran out, we took them offline, but the equipment is still working,'' Johnson said. The switching equipment handled calls for AT&T business customers in Lower Manhattan. The company rerouted calls and suffered no network outages, Johnson said. AT&T will retrieve the equipment once it gets approval from New York City and disaster teams to approach the rubble of the World Trade Center. The New York-based company said none of its employees were injured or killed in the attacks. service notice when a major event occurs. More info will be posted on this if and when it becomes available. There are not many of us left who remember the WWII days, but the Bell System played a vital role in the war effort. From research & development, manufacturing, personnel and communications, the Bell System and its structure was every bit a part of our national defense as the War Department (Department of Defense). The Bell System published War Update or "Reports". We have two listed here on our site in .pdf form, and contain some interesting historical information on the war effort. The official listing and location of all AT&T Mobility towers throughout the United States. "This is a recording . . ."
Ever wonder how the Bell System played those recorded message on you phone when you dial a wrong number or a number no longer in service? Well, wonder no more! Click HERE to read an article on the Automatic intercept service machine found in an old Bell Laboratories Record magazine. Also, check out the Bell System Recorded Announcements (SIT Tones). Click HERE. Here's an article from an old Bell Laboratories Record magazine on testing plastics for aging problems. Click HERE to read it. Solar Battery - Developed by Bell Laboratories, the solar battery (a.k.a., photovoltaic or solar cell) generates electric power from sunlight. Direct Distance Dialing - No longer will you need an operator to connect you to a long distance number; you can dial it yourself. The '64 - '65 New York World's Fair was the second time in just a couple of years that the Bell System had a pavilion in a World's Fair; the other was in Seattle, Washington in 1962. The Bell System press release descriptions and photos of the Bell System pavilion of the New York World's Fair was made available to this web site by Rob Hallam. A big thanks to Rob for taking the time to scan the images and copy the text descriptions for this web page! Photograph of the Bell System Pavilion. "The Bell System floating wing --- 400 feet long, 200 feet wide, 87 feet high --- is composed of two major elements; a chair ride and a series of live demonstrations, displays, and audience participation games. The ride tells the story of communication from bongo drums to satellites. "Bell System Hostess Rita Smith points to a model of a Cable Ship Long Lines whose job is to lay submarine cable along the ocean bottoms of the world. Right now she is in the Pacific Placing 5,600 miles of it from Hawaii to Japan. This cable can carry 128 conversations at one time --- about three times as many as the first one placed in 1956. This was brought about by an electronic development called TASI which is demonstrated at this exhibit." "One of the major elements of the Bell System exhibit is a chair ride, which tells the story of communications from bongo drums to satellites. The theatrical techniques include three dimensional stage settings, front and rear projection of still and motion pictures, narrative and original music by Morton Gould. In this scene, man discovers the magic of written symbols." The Serpentine booth is one of the Bell System innovations at the New York Worlds Fair. It features a Touch-Tone phone in each wavy coil [booth]. The model is Bell System Hostess Joan Solimine. "Bell System Hostess Laura Farrell demonstrates use of Artificial Larynx. It was invented by the Bell Telephone Laboratories to provide a voice for those who have lost the use of their vocal cords." A color postcard of the Bell System Pavilion can be seen by clicking HERE. In addition to the above donation of photos and documents by Rob Hallam, I also was given the following audio track from the chair ride of the Bell System pavilion for this web page by Ray Dashner. A big thanks to Ray for allowing me to include the Bell Telephone portion of his 5+ hour audio tape (recorded on VHS tape) of the various exhibit rides of the 1964-65 New York World's Fair. The audio file is about 14.5 minutes long. Party Lines in the U.S.A.
- a blast from the past! In the early days of the telephone in the US, telephone circuits consisted of one wire with a ground return. Circuits were few and there was little interference from electric power distribution. 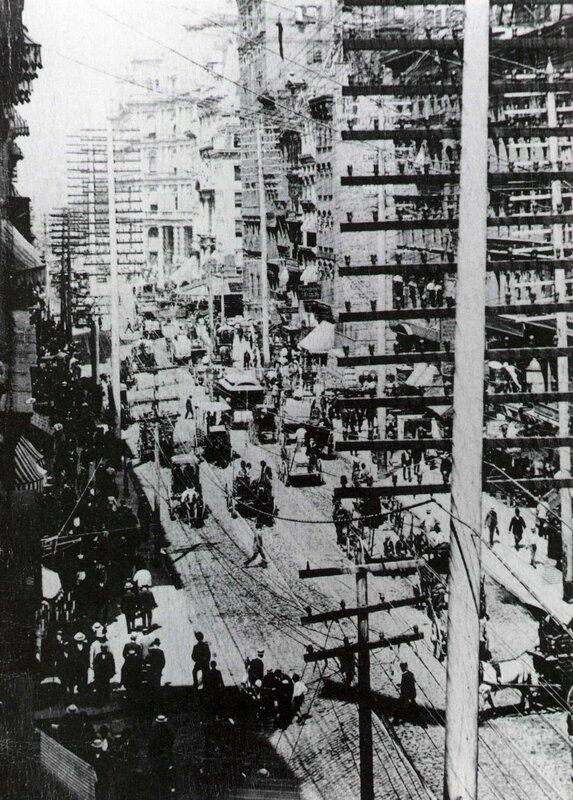 As demand for telephone service increased in urban areas, it was necessary to migrate to “full metallic” i.e. two wire lines. Multi-pair telephone cable had not been developed, hence each line required crossarm space for two pins and insulators. In high density urban areas there was a limit to the number of crossarms that could be places on a given pole. In rural areas, great distances between farms became a barrier to economic pole line “open wire” construction. Many rural or “farmer” lines were constructed by the farmers themselves. Sometimes the lines consisted of a single wire attached by a porcelain knob to a two by four nailed to a fence post. Given the above economic and physical barriers, party lines became a feasible solution to providing service to all who needed it. In the early days of party line service, the ringers on all telephones were “bridged” across the telephone line or in the case of one wire service connected line to ground. Whenever there was ringing current presented either by the operator or by a subscriber turning the magneto on his telephone, all telephones on the line would ring. In order to differentiate what party the call was for, a system of coded rings was developed, usually a combination of long and short rings. Example: Telephone number 46F31, in this case, the “F” indicates “Farmer Line”, the 46 is Farmer Line 46 and the 31 is the ring code - three long rings and one short ring. Other schemes were used where the last digit of the phone number denoted the ring code, last digit 1 denoted one long ring, 2 denoted 2 rings - - - up to five and then 6 would be one long and one short, 7 one long and two shorts etc. Rural lines frequently had as many as 20 parties and the telephone was ringing all of the time. A means of reducing the number of rings heard by a party was desirable. In those days the concept of everyone having a one party line was unthinkable! Several methods were developed both by the Bell System and the Independent Companies to reduce the number of rings heard by a given subscriber. At this point we probably need to take a look at some definitions. Going back to basics, the telephone circuit in its simplest form consists of two wires, i.e. “tip” and “ring”. This terminology originates from the plug on the operators cord which has a tip contact and a ring contact. TIP - Usually the green lead in the line cord. RING - Usually the red lead in the line cord. GROUND - The yellow lead in the line cord which is/or was connected to the ground point at the protector where the telephone line comes in to the building. In the central office, this lead may be refereed to as the “sleeve lead” again from the sleeve of the operators cord. BRIDGED RINGING - All ringers on the line are “bridged” or connected across the tip and ring leads of the line, hence they all ring at the same time and every party hears all rings. Since there was usually some form of lightning protection at the premises, usually carbon blocks with an air gap to the ground rod, a ground connection was readily available at the customer premise. Since ringing current is not readily affected by stray noise sometimes present on a ground return, the ground (or earthing electrode for you good folks in the UK) can be utilized as a return path to the central office. SELECTIVE RINGING - By utilizing the ground return, several methods are available for reducing the number of rings heard by any given subscriber. FULL-SELECTIVE RINGING - Regardless of the number of parties on a given line, an individual subscriber hears only his own ring. SEMI-SELECTIVE RINGING - Each party hears only half of the rings on a given line. DIVIDED RINGING - Half of the ringers on the line are connected tip to ground and half ring to ground. In this manner, any given party only hears half of the rings on the line. In the case of a two party line, each party hears only his own ring (Full selective ringing). In the case of four or eight (or more) parties, a subscriber hears half of the rings on the line (semi-selective ringing). Up to this point, things are pretty simple, a single telephone set can be used for any application. From here on, the stocking of sets becomes a bit more complicated. SUPERIMPOSED RINGING - Here, 20 Cycle ringing current is superimposed over a DC bias, either negative or positive. With this arrangement, four party service can be Full Selective and eight party service Semi-Selective. This arrangement requires either a relay or gas tube in each telephone to detect the DC bias and respond appropriately. It is necessary to use a special set with the gas tube and each set must be configured on site for the particular party code. 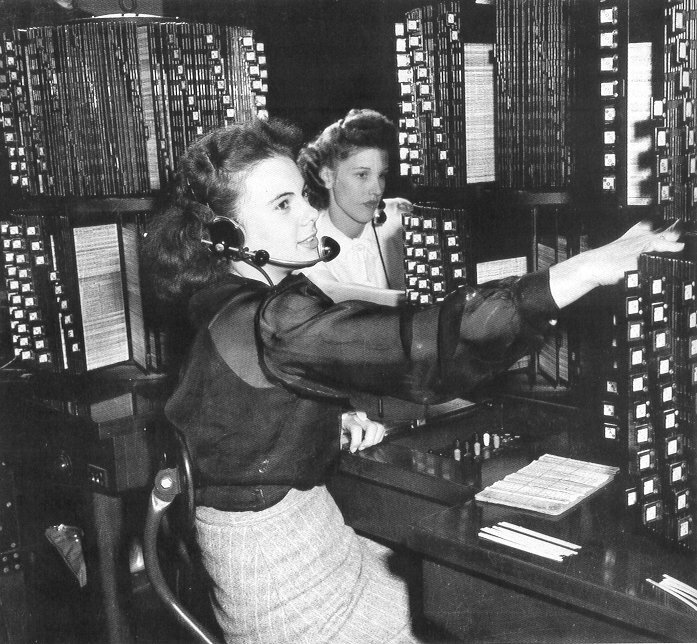 Superimposed ringing was widely used in the Bell System. FREQUENCY RINGING - (See Ralph Myers book page 48) Uses five different ringing frequencies hence five types of ringers. This makes stocking of sets a little more complicated. With Bridged Ringing, 5 parties can be Full Selective, with bridged ringing, 10 parties can be Full Selective and with Superimposed Ringing, 20 party Full Selective Service can be achieved. Stromberg Carlson in the XY switch did indeed accommodate 20 party full selective service. Frequency ringing was rarely used by the Bell System but it was widely used by the Independents phone companies. HARMONIC RINGING - the most common form of Frequency Ringing where the ringers were tuned to 16 /23, 33 1/3, 50, and 66 2/3 cycles per second. Since these are true harmonic frequencies, false ringing became a problem in some cases. AE solved this by using “non-harmonic” frequencies of 16, 30, 42, 54 and 66 cycles per second. I think Gary Goff mentioned having an AE40 with a 54 cycle ringer in Southern California. Another variant was “Decimonic Ringing” utilizing 20, 30, 40 50 and 60 cycle ringers. With the advent of more sophisticated electronics, these frequencies could easily be derived from the commercial 60 cycle commercial power. This may be like asking for the time and getting a response of how the clock works but in essence this is why most WE sets have straight line ringers and many AE, SC, North and Kellogg sets have “tuned” ringers. NANP Discussion 2003 Document - "Understanding the North American Numbering Plan"
An interesting document contributed to this website by David H. Bench, NCE. He has been in the telephone business for 38 years. He worked for New York Telephone, Continental Telephone, Alltel, Starnet Long Distance and for the last 16 years, Nortel Networks (Northern Telecom, Northern Electric). He is presently involved in industry standards (or lack of). He participates in the forums associated with the Alliance for Telecommunications Industry Solutions. David also sits on an FCC Advisory Council called the North American Numbering Council (NANC). 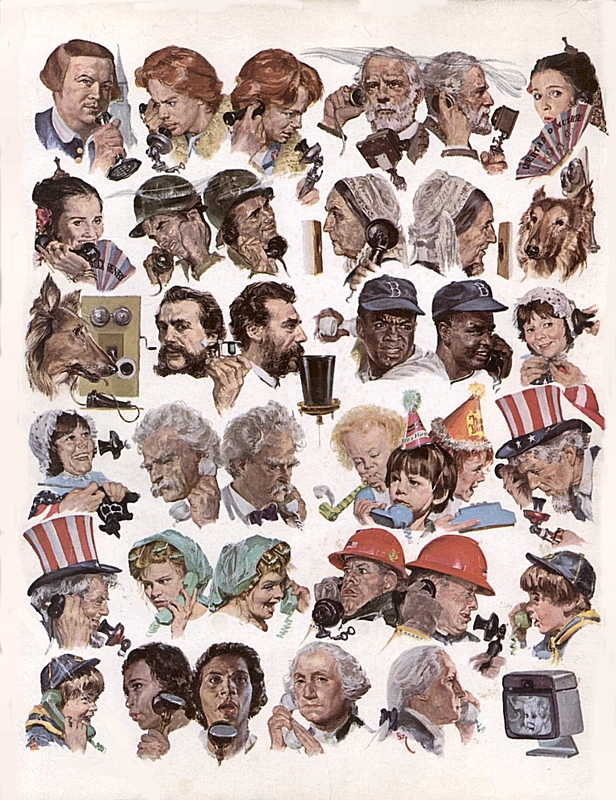 A famous New York Telephone phone book cover was scanned and sent to me from Remco Enthoven of the Netherlands. To view a larger image, click on the thumbnail size images below. Close up of Panel system Linefinder bank and brushes. Taken late 1993. Equipment had been dead in place from 1978 or before. Brooklyn or Queens NY, 3Q93. A big thanks to Paul Wills for the following photo and description! A photograph of his Western Electric Number 5 Toll Test Board. It is what got him started. It came from the Pennsylvania Railroad 30th. St. Station in Philadelphia. It was installed around 1935 and retired in 1981. The Voltmeter position where the initial tests for shunts and grounds were made. This is also where the Wire Chief talked to the field people and applied various test tones from. 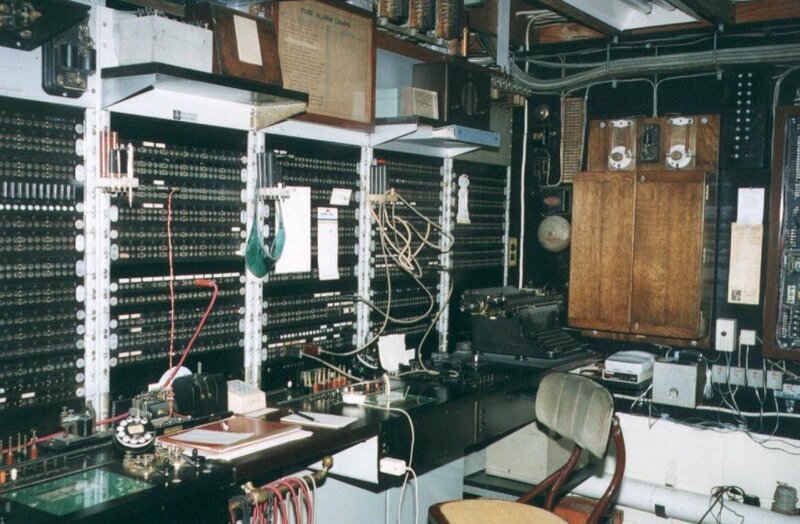 The Telegraph position where Morse and Teletype circuits were maintained. This had several monitor keys and sounders and a milliamp meter for checking the loops. The Wheatstone Bridge which was used to locate the exact distance to a fault in the line. The bridge uses a reflection galvanometer. It's a spectacular piece of equipment! Thought some of your former WE/AT&T/Lucent folks (plus a few SBC people) might want to see this picture. They got everyone together today to take a picture by what they think will be the LAST #5ESS Switch Module to ship out of the OKC factory. What a sad day. A few people didn't show up for the picture, but you can tell there are not a lot left out of the 4500 we used to have. They terminated more shop people today, not sure, I saw the list but I would guess 30-50. They won't move the last production out until approx. the end of November is the best guess. If we were running full speed ahead right now, as we normally did this time of year, I don't know how we could possibly be doing this transfer. 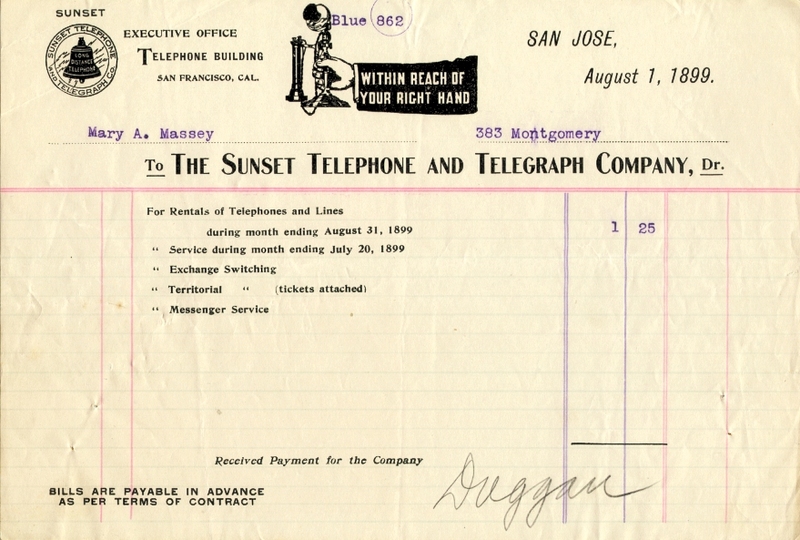 Sunset Telephone and Telegraph was one of the many small California telephone companies attached to Pacific States Telephone and Telegraph. It was later was absorbed into Pacific Telephone & Telegraph, all part of the Bell System. Thanks to Steve Hilsz for sending this piece of history. Business Week headlined it: "An End to Free Phone Information." A TV news broadcast in New York said: "Here's the wave of the future, maybe. The telephone company in Cincinnati is going to start charging its customers 20 cents each time they call information and ask for a phone number. Then after you get it, of course, you'll still have to pay to call it. Well, this splendid little development will bring Cincinnati Bell an additional $14 million a year ..." An editorial in a California paper began: "The free use of the service goes back to the beginning of the telephone itself..."
All three statements are incorrect -the TV newscast grossly so-and all three share a common misunderstanding about what, for some years now, has been called Directory Assistance. The truth is that DA is not now and never has been a "free" service. The money required to provide it comes out of general revenues in all the telephone companies, and so is built into the rate base as a portion of each customer's basic service charge. All customers have always paid for Directory Assistance, whether they used it frequently, occasionally or not at all. In March of this year, Cincinnati Bell became the first telephone company to change the payment system for Directory Assistance service. Cincinnati's action was prompted by a significant change in calling habits that is nationwide in scope. Calls to DA in recent years have been growing much faster than the increase in customers; the sheer volume of such calls has been doubling about every 10 years and the cost of handling them has multiplied three to four times per decade. If this trend continues, use of DA service could easily double by 1980, raising today's annual cost of almost $400 million to over $1 billion. The total of almost five billion DA calls in 1972 was an increase of 93 per cent over the 1962 figure; if this growth rate is not curtailed, Directory Assistance will be handling some 10 billion calls a year by the end of this decade. The operator force dedicated to the service would have to grow from the present 40,000 to 66,000 to handle the increased volume. Because this shape of things to come has been evident for several years, the idea of charging for DA service on a per call basis is not new -it was being proposed at AT&T in 1970. A major consideration commending such a change was a trend in DA usage patterns revealed by studies made in several associated companies. The primary finding could fairly be described as an instance of the tail wagging the dog: on a System average, only 10 to 15 per cent of all customers were making half the calls to Directory Assistance. Since these calls did not appear on any telephone bill as separate, identifiable charges, these busy callers paid no more for the service than did other customers who used it rarely or not at all. The principle of charging for DA calls on a fair-share-of-usage basis has seemed an equitable way of lowering costs of the service by asking those who use it most to pay as they go, while exempting light users and nonusers. But this principle has advantages beyond equity of usage: operator wages and the formidable expenses of recruiting and training are the largest components in the mounting cost of DA service. A significant drop in DA traffic was anticipated once charging went into effect, thereby permitting a gradual reduction in operator forces. Experience in Cincinnati Bell shows that calling volume has actually dropped far below the level originally estimated. The company had expected that 18 per cent of its customers would be billed for their use of the service under the new system. To date, however, only 5 per cent are finding charges for DA calls on their bills; the other 95 per cent are not asking Directory Assistance for more than three numbers per month. This allowance is a basic element of the Cincinnati plan and will probably be an essential feature of all future plans filed by Bell System companies. The Cincinnati plan permits three DA calls per line per month without charge; additional calls to the service are billed at 20 cents each. There are exceptions: customers unable to use the directory because of visual or other physical handicaps are exempted, as are those seeking numbers from coin phones, hospitals, hotels or motels. The three-call allowance was determined after DA usage studies showed it would accommodate the vast majority of Cincinnati Bell customers seeking help for new listings or for numbers not in their local directories. Revenue from billing for DA service was a factor in developing the plan, but its contribution to earnings was predicated also on cost savings. In August of last year, the Public Utilities commission of Ohio granted Cincinnati Bell an annual revenue increase of $14.1 million (the source of the misstatement in the TV newscast quoted earlier). Part of the amount-$1.4 million was to come from the DA charging plan. In fact, the company billed customers about $24,000 per month for DA calls beyond the three-call allowance through June-an amount equal to about 17 per cent of the anticipated monthly revenue. However, savings in the cost of providing DA service have exceeded the original estimates, thus helping to offset the difference between anticipated and actual revenues. These savings have come through reduction of the operator force. The number of DA operators in Cincinnati's territory dropped from 312 in January to 212 in August. In January, DA operators were handling an average of 65,000 local calls per business day; this shrank to about 14,800 per day the first week after charging started and has averaged about 16,500 a day through July. There were no layoffs, however: the operator force was reduced through normal attrition, transfers to other jobs and promotions. Cincinnati will continue to evaluate the plan during coming months. Meanwhile, says general traffic manager William Galle, "It is apparent that Directory Assistance charging does what it was designed to do-reduce the number of calls to Directory Assistance and place the burden of payment with those who use the service the most." Before committing itself to the new system of charging for DA calls, Cincinnati, as have other Bell companies, tried a variety of programs to control the rising volume of DA traffic. Advertising campaigns exhorting people to "look in the directory first," improvements in phone directories making them easier to use, personal directories given to customers to record frequently called numbers, out-of town directories provided free of charge-all produced only limited success and certainly did not solve the problem. That the solution to the problem -which affects the whole telephone industry, Bell and Independent companies alike-lies in the new direction taken by Cincinnati Bell seems beyond question. Other companies have already joined in implementing the principle. The New York Public Service Commission has given New York Telephone permission to institute a DA charging plan similar in substance to Cincinnati's. The main differences are in the rate for calls beyond a three-call allowance: 10 cents rather than 20, and the addition of a 30-cent credit to each customer's bill. The net effect of this provision allows the customer to make six DA calls-three on the allowance and three more that reduce the credit by 10 cents eachbefore any additional DA charges appear on the bill. It will be about a year and a half before the plan can be put into effect, since automatic recording and billing equipment must be installed first. Also joining the move toward Directory Assistance charging is Southern Bell, with filings in Georgia and North Carolina. Wisconsin Telephone's and New Jersey Bell's recent filings with their commissions include a DA charging provision like that in Cincinnati. These filings typify a definite future; AT&Ts Chairman of the Board John deButts has stated that it is now Bell System policy to charge for Directory Assistance service throughout Bell territory. Some Independent telephone companies also have been considering DA charging plans and these may involve varying degrees of Bell- Independent coordination. Application of a DA charging plan similar to Bell's may reduce the Independent's traffic volumes, even though some of their equipment used for the service functions differently from Bell's. Since actual operating experience with the new concept extends over only a few months in one company, there are some rough spots yet to be smoothed out. For example, the trend in rate-making is definitely toward usage-sensitive pricing-improving earnings and holding down capital requirements by encouraging use of less costly services while reducing use of much more costly ones, such as DA. There is also the distinct possibility that spreading application of Directory Assistance charging may significantly affect the distribution and content of telephone directories. Inevitably, there will be differences among DA plans, varying according to local conditions in the various companies. Commissions must be dealt with; public understanding must be enlisted; equipment for mechanized billing (if needed) must be installed. Local variations are sure to develop, but the underlying principle will remain the same as more DA charging plans are introduced. And surveys have shown that employees -whose understanding must also be enlisted-approve of the principle. They feel that charging on a per call basis, after an allowance, would put the burden of paying where it properly belongs-on the frequent user; that a charge would probably be an effective way of getting people to t_se directories, or at least to think twice before calling DA; and that a charge would either reduce call volumes and related expenses by deterring unnecessary requests, or that it would generate sufficient revenue to offset a portion of the costs and thereby postpone a general rate increase needed in part to cover rising DA expenses. There is evidence that part of the public also appreciates the logic of the System position. An editorial in the Register-Pajornian in Watsonville, California (quoted in part here at the outset) goes on to say: "The idea has merit, we feel, if information service is being misused by callers. And there's every indication of this, especially in some households and business firms where it's common practice to dial Directory Assistance to get a number rather than looking it up in the phone book. Obviously there's no way for Pacific Telephone to distinguish between legitimate calls for information and those made by people too lazy to reach for the phone directory... In any event, the phone company is a public utility, and if it has to hire armies of information operators because part of the populace can't be bothered to use the telephone directory, we're all going to get stuck for the bill. Imposition of a charge, we think, would drastically cut the abuses of information service, releasing funds for other purposes. It might even hold the rate increases down." In light of experience and of future plans, Bell people would be inclined to agree with the editor.